Sweet Home Alabama: Merry Christmas! I love your Christmas card!!! Such sweet pictures! Ooohh, love love love it!!!! Your card is adorable, how could it not be! Look at the subjects. Have a wonderful Christmas!!! I just had to take a sneak peak especially since you said you didn't use "Christmas pictures" I was curious what you did use. 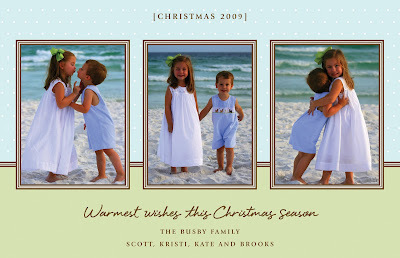 Good choice this is a great Christmas card & such cute pics of the kids.